Water depth isn’t a constant thing — nor is it something we should take for granted. Because commercial vessels carry and transport the greatest portion of the world’s goods, waterways are all-important maritime highways that boats and ships count on to be safe and navigable. Unfortunately, nature doesn’t care about commerce, so the process of sedimentation — or the accumulation of silt, sand and other debris — continuously occurs as streams, rivers and currents deposit sediment downstream. Waterways are busy places that typically see heavy traffic under tight schedules. For this reason, both the method of dredging and the equipment chosen to perform the task must be a good fit for the job. Unlike restorative dredging that usually doesn’t need to be accomplished within a specific time frame, preventative dredging typically has to occur while adhering to strict time constraints and causing the least amount of disruption to channel traffic. 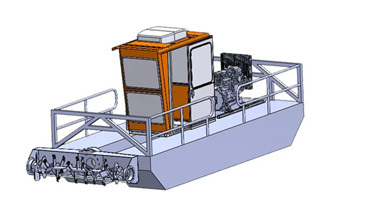 For these reasons, the Dino6 Sediment Removal System is an exceptional choice for waterway dredging. 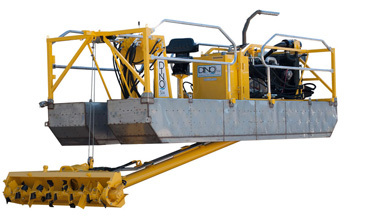 In contrast to cumbersome mechanical dredges, the powerful yet compact hydraulic system of the Dino6 safely removes sediment from waterways without causing damage to shorelines or obstructing traffic. The Dino6 is a lightweight, compact, and portable waterway sediment removal system that’s easy to transport and simple to use — mobilizing, launching and removing the machine is a breeze. Portability: Able to operate in a mere 14 inches of water and weighing in at only 3800 pounds, the Dino6 was created for maximum portability. Also, at 22 feet long and six feet wide, the footprint of the Dino6 is minimal while its performance remains best in class. Accessibility: Larger dredges require two or more trucks to haul and assemble them, but you can haul the Dino6 with one tow vehicle pulling one trailer. This allows you to reach any waterway with the least amount of hassle and greatest agility. Once on site, launching and recovering the Dino6 requires minimal effort. Capabilities: Don’t let its compact design fool you — the Dino6 is a powerhouse. It features a 1500 gpm heavy-duty pump that can pass three-inch pieces of debris. 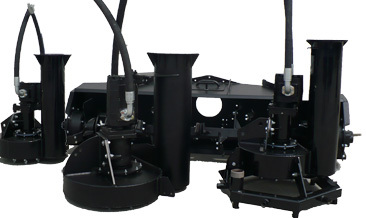 Its suction boom is equipped with a durable high-torque, direct-drive cutter head. And its fuel efficiency — at just three gallons per hour of fuel when pumping — lets you work longer for less. The Dino6 is equipped with a 6″ submersible pump that can pass large solids more efficiently than similarly sized cast pumps. For superior customer service and equipment recommendations, contact us today. We’re always happy to answer your questions and share our waterway dredging expertise. To learn more about dredging, click here!